The tests were conducted at 4S as a stress test (up to 170% of rated current), the quadcopter uses 3S. The tests were ‘scripted’ by an Arduino RC servo ramp generator. 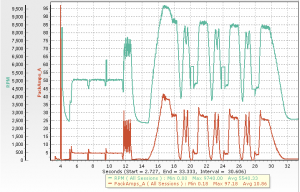 Above is a graph of current and rotational speed from Elogger. 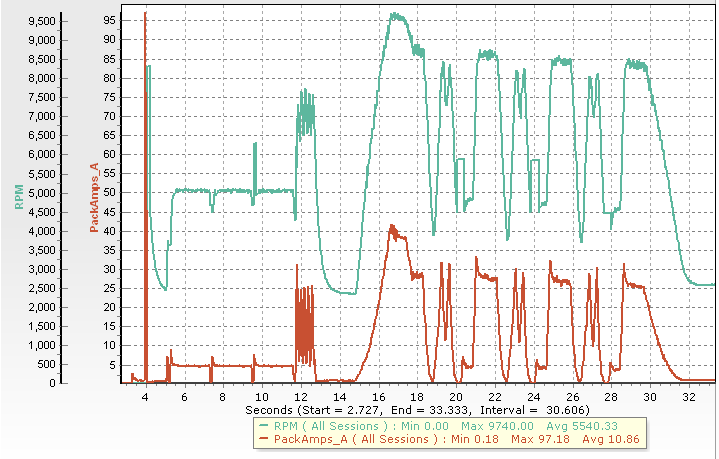 The drive system is very responsive and shows not signs of sync problems (evidenced by erratic current for instance). The ESC comes with 4700pF BEMF capacitors which had to be removed for best performance.